Inhabited since prehistoric times, Greenwich oozes history, from the Roman and Anglo-Saxon remains in Greenwich Park to Christopher Wren’s majestic Naval College. But take a stroll along the foreshore, in the shadow of these glorious buildings, and Greenwich’s rich history comes to life at an entirely different level – the foreshore is quite literally an historic rubbish dump. 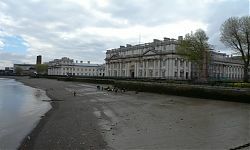 It seems those who lived in the Tudor palace and the adjoining friary, which both stood on the site now occupied by the Naval College, used the Thames as a giant bin. As soon as you descend the steps onto the pebbles and mud the sheer volume of old bones and oyster shells are immediately apparent – perhaps the result of all that debauched Tudor feasting? Cows, pigs, sheep and even boar, litter the surface and in some places are washed by the tide into thick, white drifts of shoulder blades, jaws (complete with teeth), ribs and larger limb bones, often with clear butchery marks. Mixed in the wealth of animal remains are the remains of pots… many pots. It seems our ancestors were not careful in the kitchen and the pieces were simply chucked out with the rest of the rubbish. 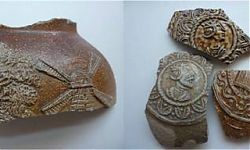 I’m no pottery expert, but talk to any of the team from the Thames Discovery Programme and their eyes light up with glee – apparently Greenwich is a treasure trove of ‘pottery bits’. I am, however, familiar with the quirky and somewhat creepy Bellarmine jars, and have been fortunate enough to find several bearded faces staring back out of the mud at me. These salt glazed jars originated from Germany around the 17th century, and were often used for wine. They took their name from the grotesque face that appears on the neck of each bottle and was meant to represent Cardinal Bellarmine, one of the Roman Catholic leaders of the counter-reformation. It is said that enraged Protestants took delight in smashing these jars, so perhaps the proliferation of broken pieces isn’t just down to a particularly clumsy serving wench. 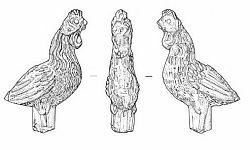 Other items that can be found in great proliferation are clay pipes, or more usually broken pieces of clay pipes. Small, white, clay tubes can be found scattered over the surface and occasionally (I usually find at least one every time I stroll the shore) a perfect pipe bowl can be found emerging from the thick grey mud. In times past people would often buy their tobacco already stuffed into a neat little white clay pipe. When they had finished smoking, or once the pipe broke, they simply threw the pipe away in much the same way we chuck away fag ends today. 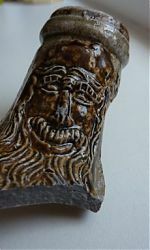 Clay pipes were still being used well into the twentieth century, although the style and size of the pipes changed considerably over the years. The age of the pipe can be told from the size of the bowl – the smaller the bowl, the earlier the pipe due to the cost of tobacco. As tobacco became cheaper, so the bowls became larger. 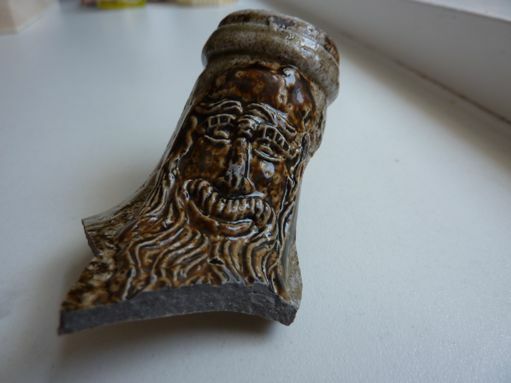 I have found all sorts of clay pipes at Greenwich, from very tiny, early ones to much later, large and elaborately decorated examples that I can only assume must be associated with the Naval College in some way. 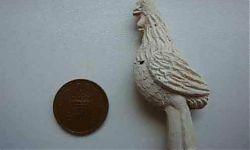 My best find at Greenwich, however, has to be the clay chicken that I discovered one day emerging from some particularly smelly mud, in an area I have been reliably informed used to be the site of a sluice! 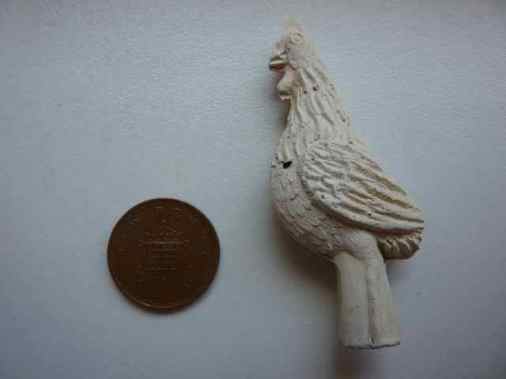 5.5cm long, solid and fairly flat, it is made of similar clay to that used for clay pipes. Deciding I needed to know more about my discovery I contacted Nathalie Cohen. We met one day this summer when the team was down at the foreshore measuring and recording what is left of a Tudor jetty. The chicken was passed around the team and after much mumbling and excited noises it turned out that two similar chickens have been found before – one in Dorking in Surrey and another at a dig in Westminster. 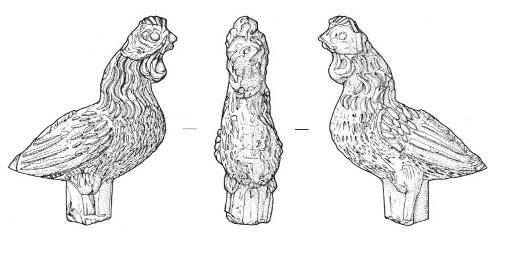 It is thought to date from the 17th century and could be a talisman or religious object, but the jury is still out and the chicken may keep us guessing for some time to come. I have been walking the Greenwich foreshore for a number of years now and each new tide reveals new and fascinating treasures. What to many people may look like a load of rubbish is, for me, a tantalising glance back into the everyday lives of ordinary people. Along with shoe boxes full of clay pipes, I have also found part of a bone knife handle, a tiny clay bead, boar tusks, beautiful pieces of pottery and leather shoe soles with the imprint of the owners feet still visible. Forget Nelson and his famous battles or Henry VIII and his harem of wives, I’m more interested in the fat cook who dropped the bowl, the child who wore out their shoes, the drunken soldier who broke his knife opening an oyster… or perhaps the monk who lost his special chicken.